Abstract: This paper investigates cooperative waterborne AGVs which are appealing for intelligent transport in port areas. The systems are with independent dynamics and objectives but coupling constraints due to collision avoidance requirements. The goal is to develop an algorithm that locally solves subproblems while minimizing an overall objective in a cooperative distributed way. The proposed approach is based on the decomposition-coordination iterations of the alternating direction method of multipliers (ADMM). In particular, we separate the variables into two sets: one concerned with collision avoidance constraints, and the other concerned with local problems; and add consensus constraints for these two. Local subproblems can be solved fully in parallel. Furthermore, optimization problems are formulated and solved in a receding horizonway. 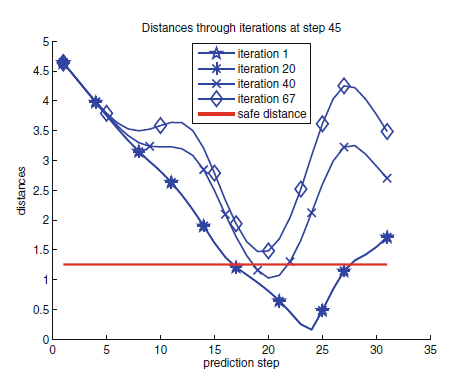 Successive linearizations of nonlinear vessel dynamics as well as the non-convex collision avoidance constraints about a shifted optimal trajectory from a previous step are implemented to maintain a trade-off between computational complexity and optimality. Simulation results are presented to illustrate the effectiveness of the proposed algorithm for cooperative distributed collision avoidance. Reference: H. Zheng, R.R. Negenborn, G. Lodewijks. Cooperative distributed collision avoidance based on ADMM for waterborne AGVs. In Proceedings of the 6th International Conference on Computational Logistics (ICCL'15), Delft, The Netherlands, pp. 181-194, September 2015.